How often have you had to listen to four or five (or more) voicemail messages on your iPhone before getting to the message you really want, or need, to hear? The iPhone’s clever visual voicemail presents a list of your voicemail messages in the order in which calls were received. But you need not listen to those messages in order. The beauty of all of this is that you can ignore (or at least put off listening to) certain messages. The addition of iOS 9 software brought a share button inside voicemail listings. It appears next to the i-in-a-circle and lets you share the voicemail message via the Messages, Mail, Notes, and Voice Memos apps. An additional shortcut for making a call is available. Drag down from near the top of the screen to display the search screen. 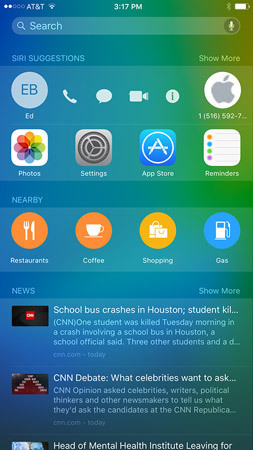 The search screen might display the Phone icon as part of Siri’s app suggestions. If you swipe from left to the right on the Home screen, you’ll see (under Siri Suggestions) circular thumbnail pictures representing your phone favorites, as well as the people with whom you’ve recently been in touch. If there’s no thumbnail picture, you’ll see the person’s initials instead. Tap Show More to see more suggested folks (or tap Show Less to see fewer). Tap the circle for the person you want to call, and then tap the telephone icon. Up slides a list revealing the various ways to contact that person, such as her home, work, and cell numbers, and maybe a listing for FaceTime Audio. With this approach, you don’t have to visit the Phone app to make a call. A handy shortcut to making a call. You can listen to your iPhone voicemail from another phone. Just dial your iPhone number and, while the greeting plays, enter your voicemail password. You can set up such a password from the Home screen by tapping Settings→Phone→Change Voicemail Password. You’ll be asked to enter your current voicemail password, if you have one. If one doesn’t exist yet, tap Done. If you have a password, enter it and then tap Done. You’ll then be asked to type the new password and tap Done twice.